The beach Praia de Albandeira with its impressive natural sea arch at the coast of the Atlantic Ocean below a blue sky illuminated by warm evening light. 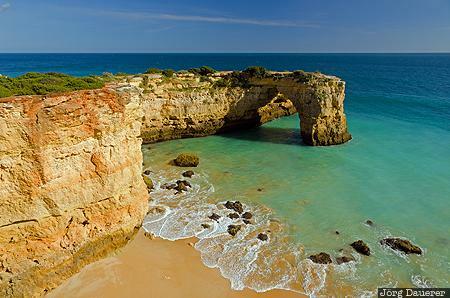 Praia de Albandeira is near at the Algarve in southern Portugal. This photo was taken in the afternoon of a sunny day in March of 2011. This photo is part of the exhibition Sea Arches (June 2018). This photo was taken with a digital camera.